LOS ANGELES, Calif. /California Newswire/ — Covert Entertainment's 23-year-old powerhouse performer, Rahccy is packing pain, pushing power, igniting love and stirring the fever in her every verse with the release of her debut single, "Miss Jill on 108th." Young, gifted and unapologetically gay, Rahccy is knocking down musical walls and rebuilding them her way, single-handedly revamping hip hop and restructuring its current status quo. Backed by the production wizardry of Covert Entertainment CEO, Dwayne "Muffla" Simon and Four Choice Productions, Rahccy's strong intention to readjust hip hop is more than just some new artist's bright eyed notion. Most notably, her producer Simon is the man responsible for blazing the music scene with his talent by writing, producing and arranging super hits for artists such as LL Cool J, Run DMC and Ice Cube. Rooted in the Los Angeles community of Watts, Rahccy is that flower determined to bloom between the cracks of concrete. Her childhood home stands on the very corner where the historical and brutal riots tore apart the city in 1965. Alchemizing an inimitable brand of hip hop, neo soul and gospel and delivering gold, one can hear the pathos of street survival in every lingering beat. Imagine if Lauryn Hill, Meshell Ndegeocello and Angie Stone were all harmonizing together on one song. You would have Ndegeochello's bottomless, balmy bass, Hill's wicked, spitfire lyricism and Angie Stone's lusciously seductive tonality. Rahccy is one tiny, unassuming woman who stands alone and delivers that power pack of fervor. 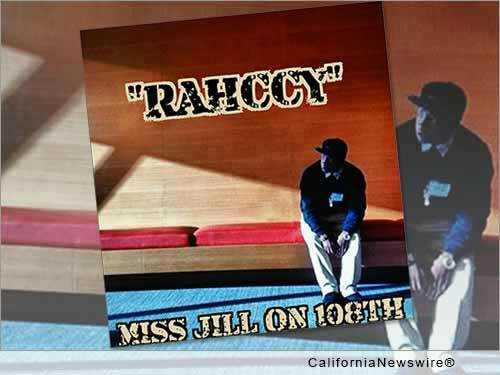 With "Miss Jill On 108th," Rahccy's old soul sentiment beams bright as she pays homage to the many older, faceless women in the community who are encountered only briefly but leave a lasting spell. Rahccy holds the torch for those who can't. Singing in church since the age of eight, Rahccy's talent garnered her initial recognition in high school when she teamed up with fellow student Rob "Galli" Salazar and won their high school competition "Bringin' Down the House" performing at the legendary House Of Blues in Los Angeles. The duo's bond continued and they were featured in a short documentary called "South Of Stars" by KPCC, which still garners views online. After surviving a near fatal car crash in 2015, her life shifted dramatically as she healed and returned back to the studio with a vengeance. Cites her producer Dwayne "Muffla" Simon, "With a string of multi-platinum hits from my work with LL Cool J to name just a few, I thought my music days were over. The music scene has changed so much and no one was lighting a fire for me. Then I heard Rahccy and I knew I had to come out of retirement. She has that rare quality that artist possess when they are bigger than themselves. Rahccy has that 'it' quality that legends are made of. As a producer, I'm more than excited because I know she is going to blaze hip hop with her passion." "I know I'm an old soul," cites Rahccy. "I was raised by my grandparents and they taught me some things crucial about love and respect. The fight of being a woman of color and a lesbian is real. As a part of that community, I'm a tool to be used in the larger context of things. I envision my music as a pioneer for change. We don't see, hear or celebrate many artists that look and sound like me. I'm here to change that." "Miss Jill On 108th" is available on iTunes and wherever online music is sold. Also check out Rahccy at http://www.covertentertainmentsoundworks.com/#!rahccy—artist/vbf5i . Friend her on social media on Facebook at Rahccy, and on Twitter and Instagram at @RahccyMusic. Miss Jill On 108th – On Itunes Now!